Playing “Song Froggy” with the game’s creator, Brian Koch. Who knew that assembling frog music bands could be so much fun? The game starts with all hexagonal game tiles centralized in the middle of the table. 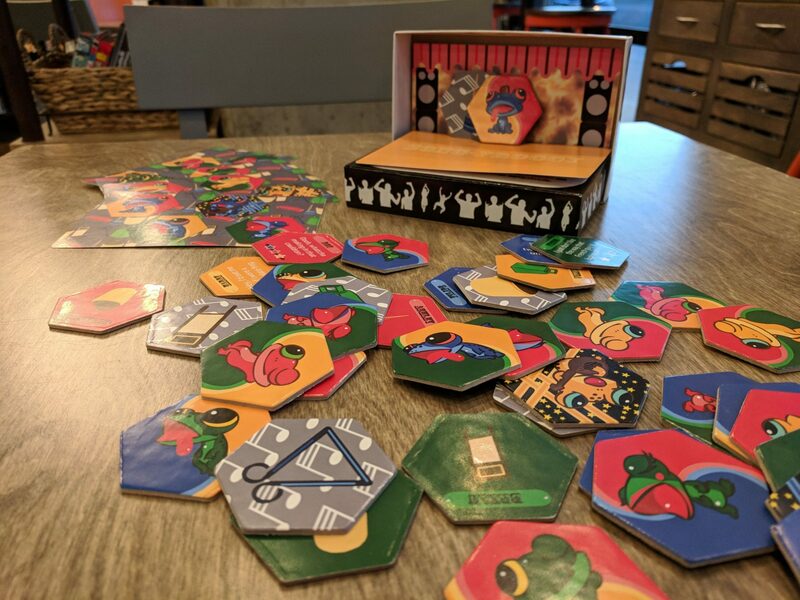 Players can either pull a tile or use gathered tiles to create a tiny amphibian band by placing the right combination of matching frogs onto the scorecards. Tiles can only be taken if they can be freely pulled from the middle. You need to collect the right frogs with the right colors and pay attention to what is left to score as well as what all the other players are doing to succeed. Are you going to create trios of harmonizing frogs or turn your toadie into a star? For a brief time–gameplay is around ten minutes–I was the talent agent for the wet, soggy underworld of undiscovered frog musicians, hedging bets for the next Justin Timberpond or Spice Frogs. It helps that there are plenty of instruments around ranging from triangles to water jugs–I can only imagine what a tiny band of frogs playing these combined with frog vocals must sound like. Will you be able to claim your next spot on the billboard on your way to promoting frog stardom or will the band need to be broken apart in what I imagined was due to frog substance abuse or unreconcilable creative differences. 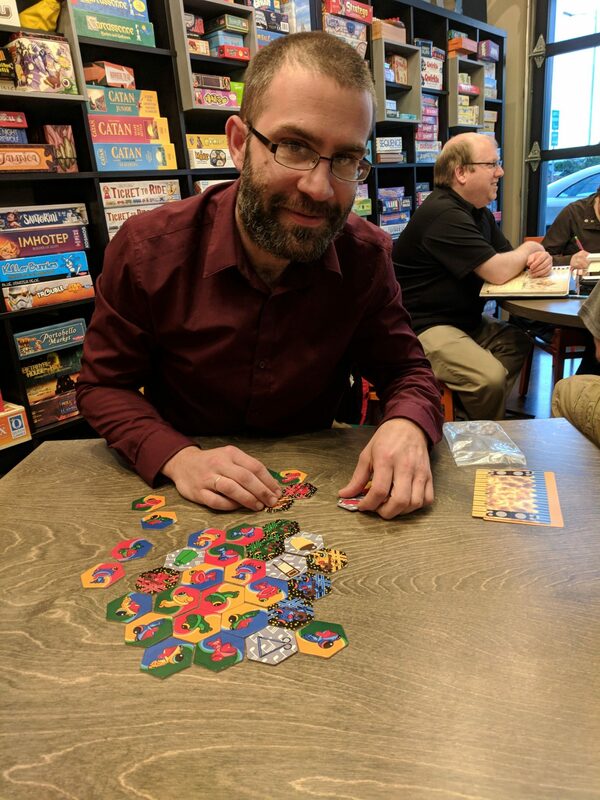 “I’m very active on The Game Crafter,” remarked Bryan. 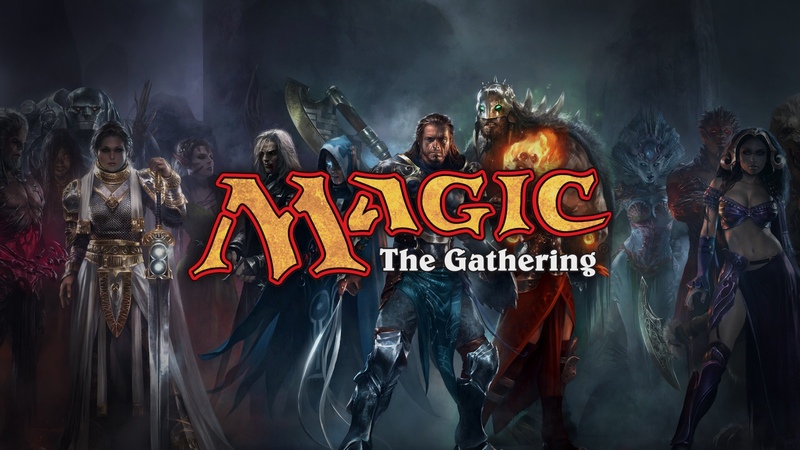 The Game Crafter is an online marketplace and community of board game developers. It also doubles as a print-on-demand service to distribute your game idea. 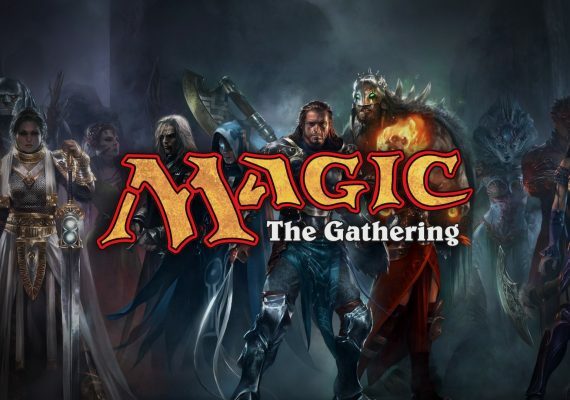 Think of it as a board game incubator with thousands of board game enthusients ready to try out your creation. 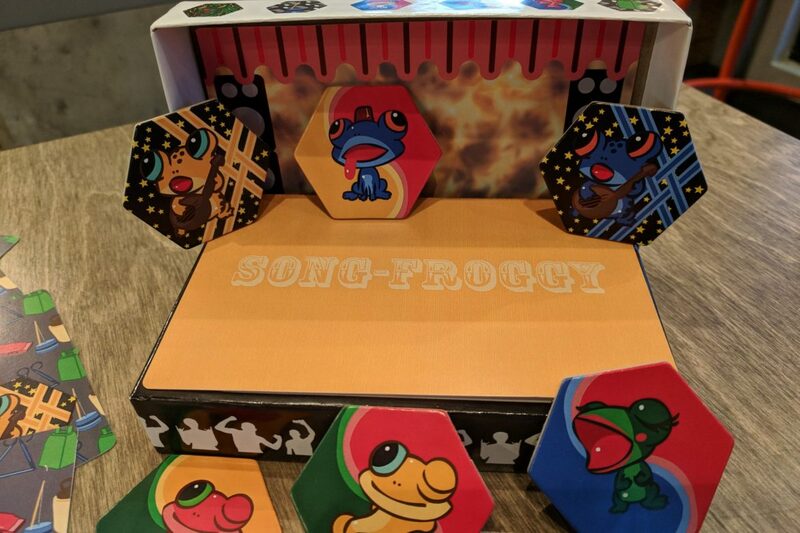 Song Froggie is available there as a print and play for purchase and was featured as a staff pick by the Game Crafter staff. “I’ve been making games for a while,” said Bryan, “when I needed to find some artwork, I reached out in the Game Crafter forums and someone responded, ‘Sure, I can draw some frogs for you!'”. And so Song Froggy was born, shedding it’s tadpole tail and growing tiny legs. 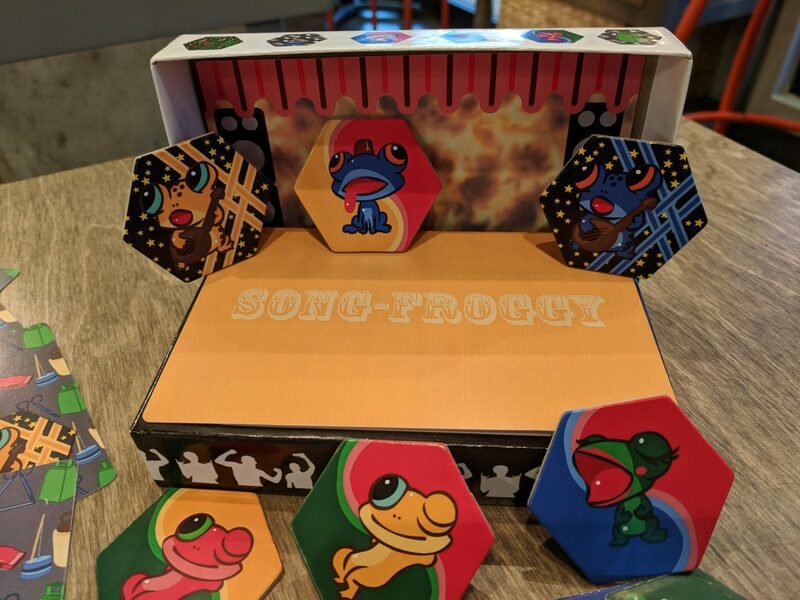 Song Froggy is one of many games by local Beaverton resident, Brian Koch. If you are a resident game designer, let us know! We’d be happy to support your latest Kickstarter or feature your game here at Game House Cafe!